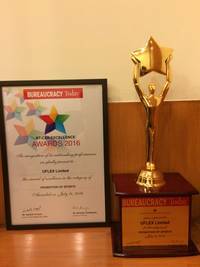 *Business Wire India**‘Sports for Growth’* – a focussed intervention by India’s largest global flexible packaging solution company Uflex Limited has been conferred with the *Bureaucracy Today CSR Excellence Award 2016. *The initiative is aimed towards realising the rights of all children to play freely irrespective of caste, creed, gender, religion, ethnicity, physical/cognitive abilities and socio-economic status as enshrined in the United Nations Convention on the Rights of the Child (UNCRC). This scientifically planned social sustainability programme that is being rolled out in partnership with a leading NGO, STAIRS in Delhi, Haryana, Uttar Pradesh, Himachal Pradesh and Gujarat emphasizes upon inclusion of underprivileged children & youth particularly the girl child and differently abled in the Sports Ecosystem of India. This further leads to social empowerment of the beneficiaries. *In a tough competition where entries from 356 organisations were received across the country, only 36 could make the final cut. *The eminent Jury comprised luminaries like *Mr. Sunil Kanoria,* President ASSOCHAM; *Dr. Arbind Prasad,* IAS, Director General FICCI; *Mr. Ajay Shriram*, President CII (2014-15); *Mr. Sunil Arora,* IAS (R), Former Secretary Information and Broadcasting Ministry; *Mr. R.S Sharma*, former CMD ONGC, *Mr. Khurshid Ganai, *IAS, Chairman J&K Public Service Commission; and *Mr. Bhaskar Chatterjee*, IAS, DG & CEO IICA (Chairman of the Jury). Some of the organisations that were also honoured along with Uflex are Hindustan Petroleum; NTPC; Tata Business Support Services Limited; Power Grid India Limited; Capgemini, Wadia Group; DLF Foundation; Tech Mahindra Foundation; Wockhardt Foundation; Apollo Tyres; Sony India; Aircel; ACC Limited; Lafarge; Cairn India Limited; Chambal Fertilizers Limited among others.